Spam, scams, and robocalls are at best annoying. For high-volume customer service centers, they can significantly impact the bottom line. Let’s leverage the Twilio Marketplace and our ruby skills to block spam callers, robocallers, and scammers. Before getting started, you should already know how to handle incoming calls with Twilio. We’ll be writing code to work with all three of these Add-ons, but you can research which one you think will work best for your requirements. Also, keep an eye on the Marketplace, as new Add-ons are always showing up. Note the “Unique Name” setting. You need to use this in the code that you will write to read the Add-on’s results. In the code for this guide, we are sticking with the default names. 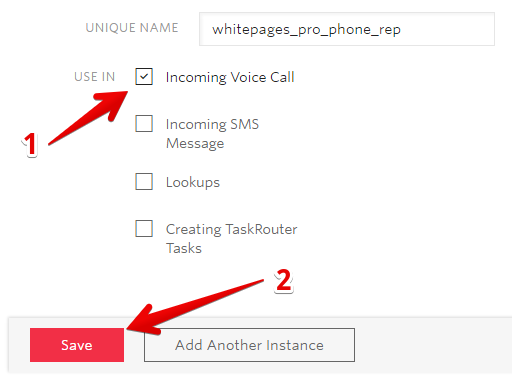 When Twilio receives a phone call from your phone number, it will send details of the call to your webhook (more on how to configure that later). In your webhook code, you create a TwiML response to tell Twilio how to handle the call. For spam-checking, our code needs to check the spam score of the number and deal with the call differently depending on whether the Add-on considers the caller to be a spammer or not. In our example code here, we’ll return a <Reject> TwiML tag to send spammers packing and a <Say> TwiML tag to welcome legit callers. Notice the code has checks for all three of the Add-ons we mentioned before. The code is written to be very flexible and handle missing data in the JSON response, so feel free to copy and paste even if you only plan to use one of the Add-ons. Next, we'll analyze this application in more details. How do we use Whitepages Pro? This function uses only information found in the key results.whitepages_pro_phone_rep. Here we advise blocking the call if the reputation's level is 4. How do we use Marchex Clean Call? This function uses only information found in the key results.marchex_cleancall. Here we advise blocking the call if Marchex' recommendation is set to BLOCK. How do we use Nomorobo Spam Score? This function uses only information found in the key results.nomorobo_spamscore. Here we advise blocking the call if Nomorobo Spam Score is 1. Now we've seen how to get advice from each Add-on but we have different options for handling the call. Let's look at how we're making the final decision. How do we finally to decide to block a call? In our example, unanimity is required for accepting a call. So for each Add-on, we look at their advice, and if even one of them tells us to block it, we'll reject the call. We could have also implemented it differently by using a majority rule. In any case, once we make a decision, all that is left to do is act. What are our options to accept or reject a call? Using <Reject> is the simplest way to turn away spammers. However, you may want to handle them differently. The whole universe of TwiML is open to you. For example, you might want to record the call, have the recording transcribed using another Add-on, and log the transcription somewhere for someone to review. For this example, we’re just greeting the caller. In a real-world scenario, you would likely want to connect the call using <Dial> (to call another number or Twilio Client), <Enqueue> the call to be handled by TaskRouter, or build an IVR using <Gather>. How do we set up this application and test it? Now we need to configure our Twilio phone number to call our application whenever a call comes in. So we just need a public host for our application. You can serve it any way you like as long as it's publicly accessible or you can use ngrok to test locally. Everything is set up now, you can pick up your phone and call your Twilio number. Hopefully, if you are not a spammer your call should be accepted and you should hear the greeting. How can I test a blocked call? As you can see, the Twilio Add-ons Marketplace gives you a lot of options for extending your Twilio apps. Next, you might want to dig into the Add-ons reference or perhaps glean some pearls from our other Ruby tutorials. Wherever you’re headed next, you can confidently put spammers in your rearview mirror.